Andrew Blowers OBE is Emeritus Professor of Social Sciences at The Open University and is presently Co-Chair of the Department for Business, Energy and Industrial Strategy/NGO Nuclear Forum. This is one of a series of articles drawn on his latest book, “The Legacy of Nuclear Power” (Earthscan from Routledge, 2017). The views expressed are personal. I still possess a lapel badge acquired back in the 1980swith the simple legend ‘I’ve been to Sellafield!’. The badges were issued as part of a publicity campaigndesigned to lure tourists to Britain’s notorious and (in)famous nuclear complex – the largest industrial site in the UK. The ironic challenge of the message was underlined more explicitly by a contemporary cartoon bearing the invitation to ‘Visit Sellafield before Sellafield visits you’. Such messages endorsed and even promoted an image of Sellafield as distant but dangerous. Other soubriquets such as ‘Sellafield – the nuclear laundry’ or ‘Britain’s nuclear dustbin’ hint at its mysterious and unglamorous purpose at the heart of the country’s nuclear operations. So what is Sellafield? Fundamentally, these days, it is the UK’s primary nuclear waste-processing, management and clean-up facility. Concentrated on a compact site of 1.5 square miles is a jumble of buildings, pipes, roads, railways and waterways, randomly assembled over more than half a dozen decades, which together manage around two-thirds by radioactivity of all the radioactive wastes in the UK. The Sellafield radioactive waste component includes all the high-level wastes (less than 1% by volume, over half the radioactivity) held in liquid form or stored in vitrified blocks, and half the volume of intermediate-level wastes (the other half being held at various sites around the country). The bulk of the nation’s low-level wastes (90% by volume, 0.1% radioactivity) are disposed of in a nearby shallow repository at Drigg. 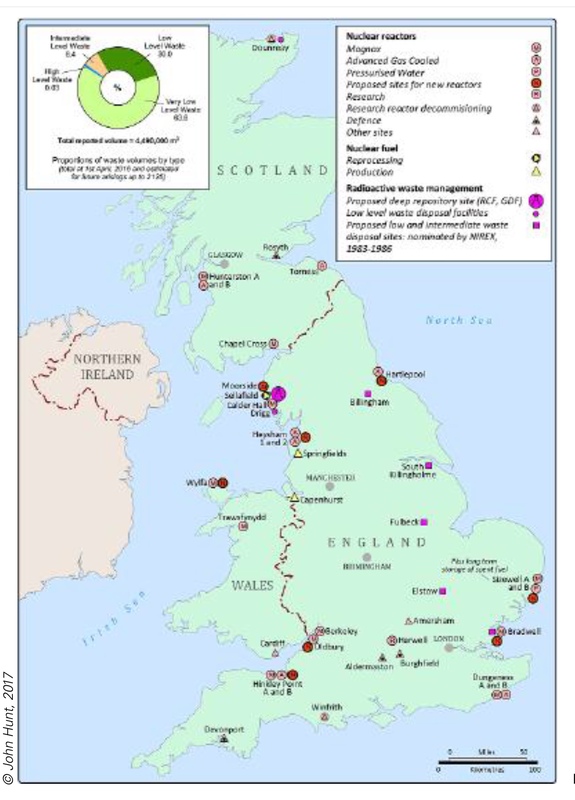 In addition, Sellafield hosts the spent fuel from the Magnox reactors due to be reprocessed by the end of the decade, as well as some spent fuel from AGRs (advanced gas-cooled reactors) awaiting reprocessing or storage. Sellafield also has the world’s largest single stockpile of plutonium, amounting to 123 tonnes in 2013 and rising to 140 tonnes by 2020, including around 15 tonnes currently foreign owned and formally due for repatriation in some form. These wastes arise from the range of nuclear activities carried out since Sellafield (then Windscale) began operations in the early post-war years. They comprise wastes arising from the plant’s initial military function of producing plutonium for theatom bomb and subsequently wastes mainly derived from reprocessing spent fuel from the civil nuclear programme (Magnox and AGR) and those originating from reprocessing foreign fuels. ‘You could say we are standing on the most dangerous place on earth.’ In rather less hyperbolic language the Office for Nuclear Regulation (ONR) considers HAL ‘the most significant hazard on the plant’ and its containment a priority. *2 Safe management of the legacy wastes is by far the most important and challenging function of Sellafield today. The long-term plan is to retrieve, characterise, encapsulate or vitrify the Sellafield inventory in preparation for deep burial in a Geological Disposal Facility (GDF). But that prospect is a far-off possibility; the reality is that for the foreseeable future the bulk of Sellafield’s wastes will have to be managed at the surface. Sellafield is a physical reality in a social context. Like Hanford in the USA,*3 it is a classic example of a peripheral nuclear community, revealing all five characteristics associated with the concept. It is, first, geographically remote, in the sense that it is, in UK terms, relatively far from major population centres, founded on a wartime Royal Ordnance factory, offering safety, security and secrecy for the clandestine operations of the nation’s military nuclear project. It is situated in West Cumbria on a plain between the iconic Lake District landscape and the Irish Sea, far from motorways, airports or mainline railways. notably the deterrent effect of Sellafield’s high wages and its monopoly of available skilled labour. This is reflected in the quite stark inequalities of income and evidence of deprivation in some parts of the area, a paradox of poverty in the shadow of a nuclear leviathan. Nevertheless, the priority given to Sellafield’s clean-up pretty well guarantees an annual state investment (through the NDA – the Nuclear Decommissioning Authority) approaching £2 billion per year, and it is estimated that Sellafield will absorb around three-quarters (£120 billion) of the total of £164 billion discounted provision for future clean-up liabilities of the nation’s nuclear estate over the next 120 years. Sustainable employment is assured for at least 30 years, with slow decline thereafter. regional importance, Sellafield exercises political leverage that confounds its apparent subordination. in bearing a burden on behalf of the nation. Over the years this combination has enabled the community to endure the adversities and respond to the possibilities as it undergoes the vicissitudes of its long transition from production to clean-up. In the frenetic post-war years Sellafield (then Windscale) was almost wholly dedicated to the production of nuclear materials, first for military purposes, later for a range of prototype and experimental facilities. The inevitable accompanying production of waste was of little interest or account. The fundamental function, reprocessing, was initially for plutonium production, using spent fuel from the first reactors. and foreign business expectations. The plutonium stockpile grew far beyond its military needs and its use in mixed-oxide fuel (MOX). The Sellafield MOX plant proved an even more abject failure, opening in 2001 with a capacity of 120 tonnes a year, producing only 5 tonnes in its first five years and declared failed and closed down in 2011.
developing acceptable proposals. By this means Sellafield emerged as the most favourable site where consultation had found a measure of public support. Despite the effort to combine scientific rigour and public acceptability, the selection had all the hallmarks of a predetermined solution concocted through a closed process of decision-making and relying on Sellafield as the path of least public resistance. Sellafield the solution, or not? The selection of Sellafield proved premature, as the case put forward unravelled in the face of opposition at the public inquiry into the proposed underground laboratory known as a Rock Characterisation Facility (RCF). The proposal was rejected in 1997 on three counts: local environmental impacts; scientific uncertainties and technical deficiencies; and the site selection process itself. The rejection was comprehensive and decisive, forcing the government, once again, to rethink and regroup. invigorated by a surging interest in participative democracy, with its emphasis on openness, transparency, partnership and engagement, backed by a panoply of processes and techniques to facilitate public and stakeholder involvement in policy-making. to inspire public confidence by finding the best method for the long-term management of the UK’s legacy wastes, the bulk of which were at Sellafield. further recommendations emphasising the longterm nature of the process through a programme of interim storage, research and development into geological disposal, flexibility to consider other options, and a staged process of implementation. of participation, partnership, and packages – to ensure acceptability, facilitate involvement, and provide the resources to encourage commitment. Predictably there was no rush of volunteers but, as might be anticipated, West Cumbria was the first, and only, community to enter into a modulated exercise in participatory democracy managed by the West Cumbria Managing Radioactive Waste Safely (WCMRWS) Partnership, including councils, the voluntary sector, and business and trade union interests, and working over three years (2009-12). This underwhelming outcome left the decision makers – the local councils – to reach their own conclusions. The two district councils in pro-nuclear West Cumbria voted to proceed; Cumbria County Council, covering also the wider region further from Sellafield, voted against. The process had stalled in what seemed its most promising location. With this setback the government once more had to regroup and review its policy for geological disposal. There appeared to be three areas where a revised approach was necessary. pursue their interest. While voluntarism remained the primary principle of site identification, it would now be within a context of voluntarism and geology. state-owned developer, working with communities. The crucial underlying principle was that the final decision-making role would sit with people in communities. A more subtle approach to the issue of ‘what is a community?’ and ‘who should decide?’ was devised whereby communities would be ‘identified’ over time as the siting process evolved and the options were refined to specific locations. The fact that a repository has a ‘physical existence’ meant that an emerging community would ultimately need to be identified based on a geographical area. The principle that the ‘community’ decides would be enacted by a right of withdrawal during the process and by confirmation of the decision to develop the repository in a test of public support. The hope was that this elaborate, extended, even elegant approach to voluntarism in practice, backed by a package of community benefits, would have the flexibility and incentives to attract communities to engage willingly in achieving a site for the disposal of the nation’s wastes. The third area concerned the timescale of decision-making. The technical and scientific challenges involved in making a safety case for a repository with engineered barriers within a host rock capable of ensuring containment of radionuclides for up to a million years were formidable. The key reason for Cumbria’s decision to pause the process was that it would be premature to proceed; that uncertainties suggested the risks were too great, certainly in the Cumbrian geological context. including wastes from new build, was quite another. As Martin Forwood of the protest group CORE (Cumbrians Opposed to a Radioactive Environment) put it to me: ‘It would be ludicrous to move it from Sellafield given the risks of transport. There was also resistance to the government’s importunity in seeking a decision to move forward, thereby locking West Cumbria more firmly into the process. And there we have it. The government’s view that ‘effective arrangements will exist to manage anddispose of the waste that will be produced from new nuclear power stations’*11 is speculation at best. The problem is that effective arrangements scarcely yet exist for dealing with the legacy wastes which, for the foreseeable future, will be stored at Sellafield and other sites, let alone wastes from any new build which would have to be stored well into the next century on fragile, crumbling or inundated coastal sites. Progress towards identifying an acceptable and suitable site for disposal will inevitably take time. The revised arrangements leave West Cumbria in the ring, probably still the favoured location. The new, evolutionary, self-defining approach to site identification is flexible, placing the veto, test of public support and distribution of investment funds in the hands of the community and not the representative political bodies. This opens up the opportunities for voluntarism, and it is highly likely volunteers will come forward from West Cumbria. Conversely, the geological screening process and the emphasis on suitable geology acts as a potential constraint on finding a suitable site in West Cumbria. The revised process might tempt other communities into the frame, areas where public support and geological conditions are favourable. There may be potential volunteers with the requisite peripheral characteristics, but few will be likely to maintain commitment over the long timescales involved. The inescapable fact is that the large volumes of wastes at Sellafield will not be in a fit condition for disposal for decades to come. And it would seem impossible, irresponsible even, to contemplate moving three-quarters of the nation’s highly active wastes miles across the country, requiring security,transfer, surveillance and logistical arrangements. The nation’s radioactive waste is mainly held at Sellafield and there it must remain, at least until the programme of management and clean-up is concluded. New production facilities such as for MOX or reprocessing are exceedingly improbable, the proposed new reactors at nearby Moorside are doubtful, and although a GDF, if one is ever developed, might yet be located in West Cumbria, Sellafield will for long be caretaker of the nation’s wastes. Where and when the undertaker will come to bury them remains unclear, and may remain so for the foreseeable future. Decommissioning Authority, Apr. 2016, p.27. ‘‘Nuclear’s wastelands. Part 2 – The nuclear frontier’. Town & Country Planning, 2017, Vol. 86, Sept., 364-69. Report. Royal Commission on Environmental Pollution. Implementing Geological Disposal. Cm 7386. Managing Radioactive Waste Partnership, Aug. 2012.